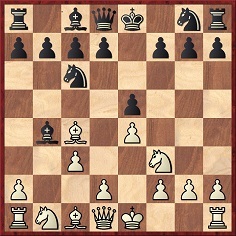 Capablanca played 47 Kh4 and eventually won after 47...Nxe4 48 h6. 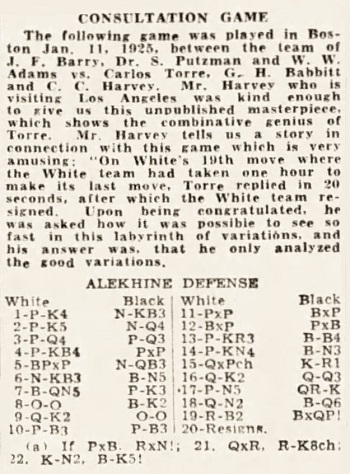 The game has been submitted by John Hilbert (Amherst, NY, New York) on the basis of notes which he took many years ago, and we are also grateful to Eduardo Bauzá Mercére (New York, NY, USA) for providing the relevant newspaper columns. 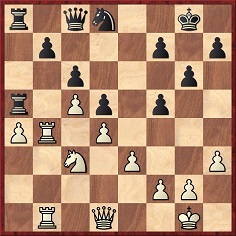 1 f4 d6 2 e4 Nc6 3 Nf3 e5 4 Bb5 Nf6 5 Nc3 Bg4 6 d3 Be7 7 O-O O-O 8 Bxc6 bxc6 9 h3 Bxf3 10 Qxf3 h6 11 fxe5 dxe5 12 Kh1 Qd7 13 Nd1 Nh7 14 Ne3 f6 15 Nf5 Kh8 16 Qg4 Bd6 17 Nxh6 Qxg4 18 Nxg4 Bc5 19 Be3 Bb6 20 a4 a5 21 Bxb6 cxb6 22 Ne3 Ng5 23 Nc4 Rab8 24 c3 Ne6 25 b4 axb4 26 cxb4 b5 27 axb5 cxb5 28 Ne3 Nd4 29 Nd5 Rf7 30 Ra3 Ne2 31 Rfa1 Rfb7 32 g4 Kh7 33 Kg2 Kg6 34 h4 Kf7 35 Ra7 Nd4 36 Rxb7+ Rxb7 37 g5 Nc2 38 Rf1 Kg6 39 gxf6 gxf6 40 Rxf6+ Kh5 41 Kh3 Ne1 42 Rf5+ Kg6 43 Rxe5 Nxd3 44 Re6+ Kh7 45 h5 Rg7 46 Rb6 Nf2+ 47 Kh4 Nxe4 48 h6 and wins. 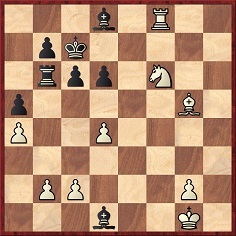 28 Bc5 Rfe8 29 Qf3 b6 30 d3 bxc5 31 dxe4 and wins. 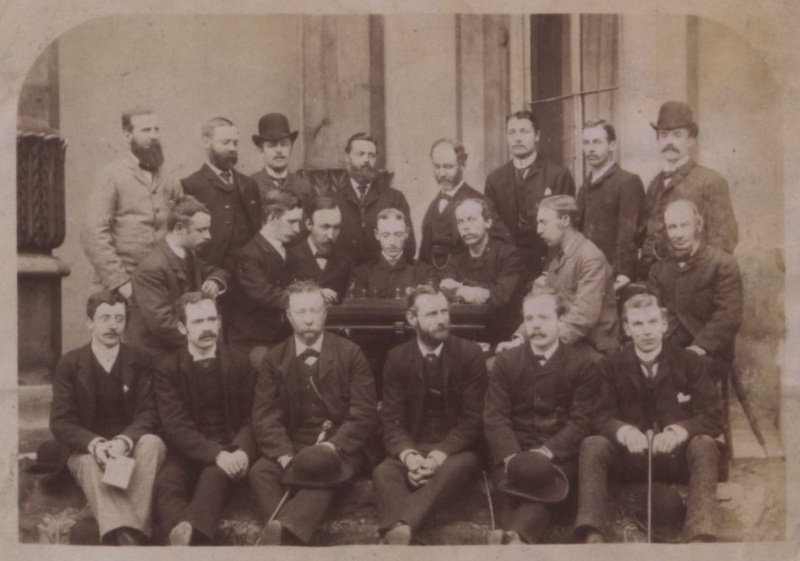 The display took place in London on 6 October 1894 (BCM, November 1894, page 462). 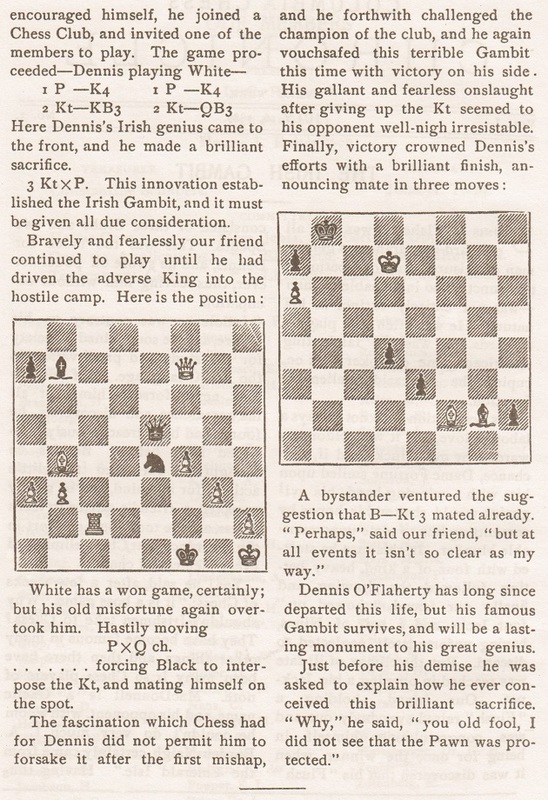 As mentioned in The Evans Gambit, there was an article about 5...f5 on pages 373-374 of the November 1915 BCM. 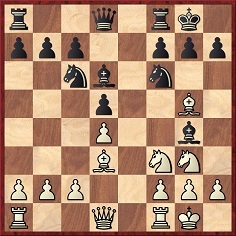 The move was played by Blackburne against ‘C. 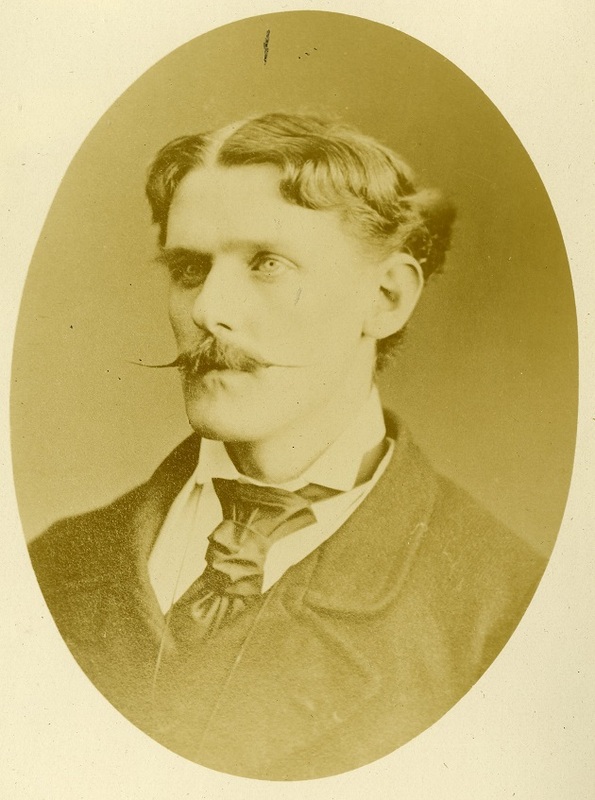 and W.’ in Hastings in 1894 (page 180 of P. Anderson Graham’s work on Blackburne) and, as mentioned in that book, was analysed by Oskar Cordel. 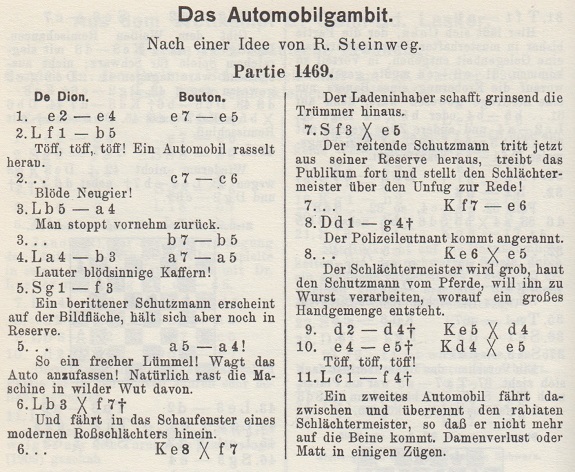 See page 76 of his treatise Führer durch die Schachtheorie (Berlin, 1888), as well as a feature on pages 56-58 of Brüderschaft, 18 February 1888. 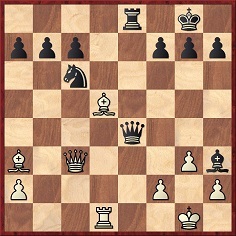 20...Nd4 21 Bxe4 Ne2+ 22 Kh1 Nxc3 23 Rc1 Rxe4 24 f3 Re3 25 White resigns. 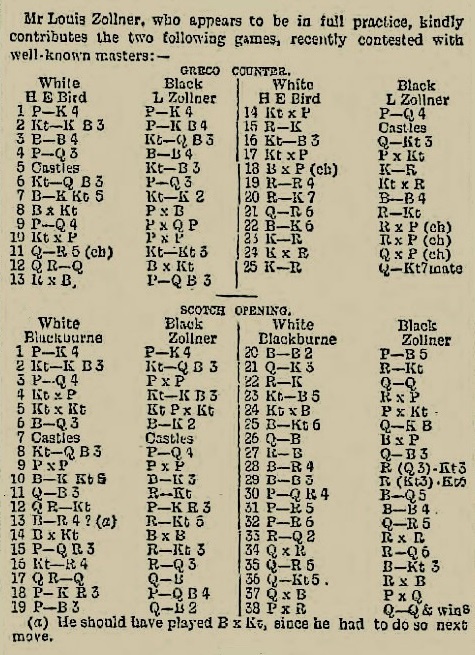 Page 496 of the December 1894 BCM gave the date of the 24-board display (+17 –2 =5) as 14 November 1894 and named two of the victors as J.W. Robson and G.H. Blunden. 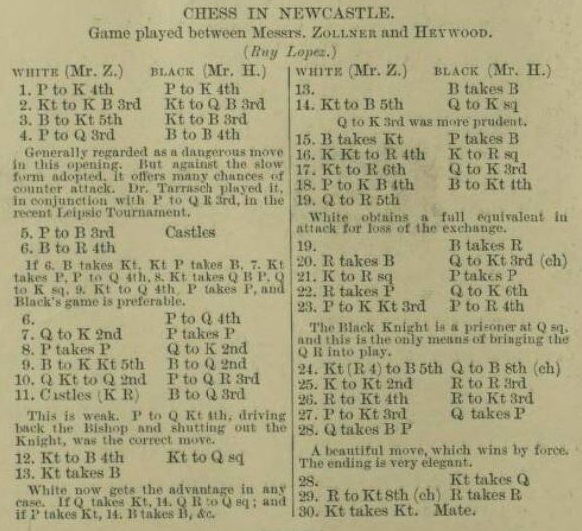 The latter’s win was published on page 2 of the Newcastle Courant, 1 December 1894: 1 e4 e6 2 d4 d5 3 Be3 c5 4 c3 cxd4 5 cxd4 Bb4+ 6 Nd2 Nf6 7 e5 Nfd7 8 f4 f6 9 Bd3 Nb6 10 Nf3 f5 11 O-O Bd7 12 Ng5 Be7 13 Ndf3 Nc6 14 Rc1 Nb4 15 Bb1 Nc4 16 Rxc4 dxc4 17 Re1 Nd5 18 Bd2 Qb6 19 Bc3 Nxf4 20 Kh1 h6 21 Nh3 Nxh3 22 gxh3 Bc6 23 Kg1 O-O-O 24 Nd2 Rxd4 25 Bxd4 Qxd4+ 26 Kf1 Bc5 27 Ne4 Qg1+ 28 Ke2 Qg2+ 29 Nf2 Qxf2 mate. 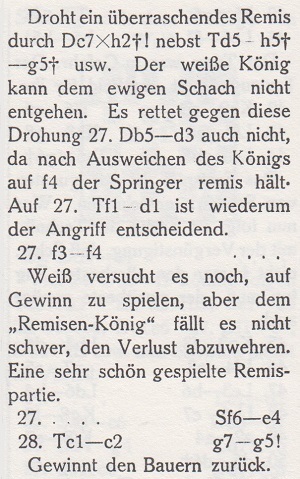 The announcement was repeated without correction on page 669 of the November 1972 Chess Life & Review. 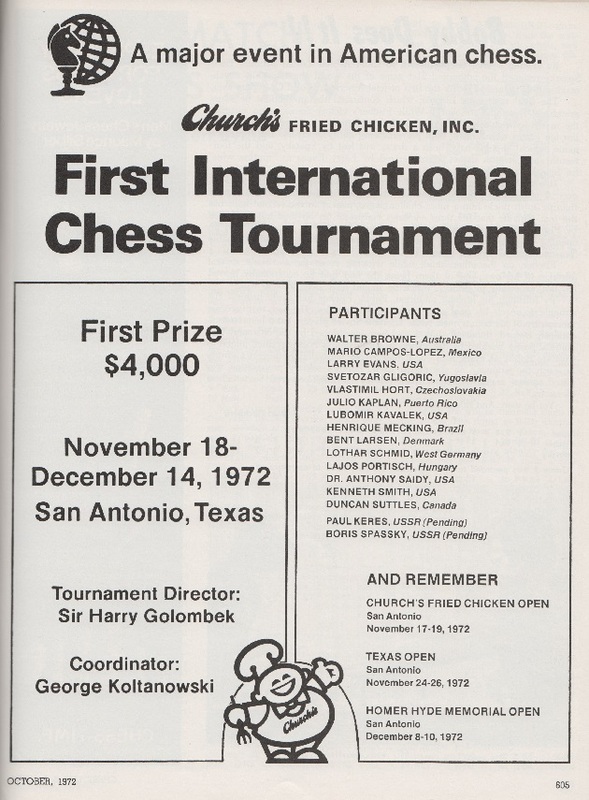 That latter issue (page 704) also had ‘Sir Harry Golombek’ in a feature about the San Antonio tournament. ‘Sir Harry Golombek’ is a mistake to be expected from Koltanowski; see, for instance, page 5 of Colle System (Coraopolis, 1984). 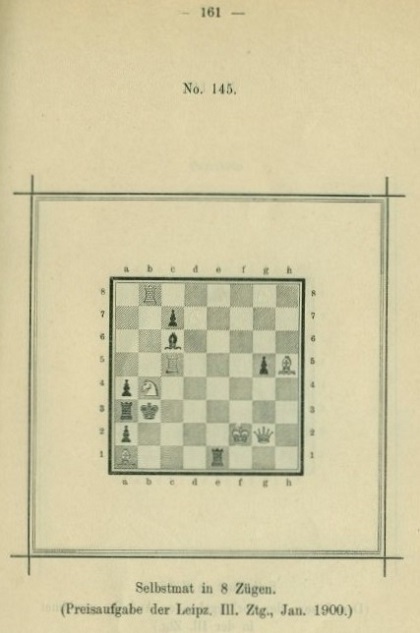 Another example from the United States is the frontispiece of the book by Larry Evans and Ken Smith on the 1972 world championship match. 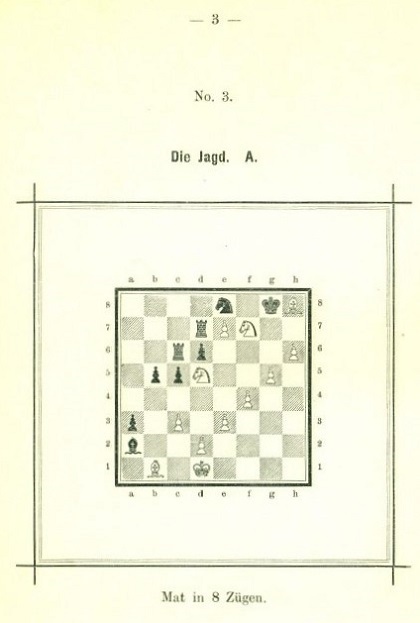 That occurrence was criticized on the cover page iii of CHESS, June 1973, yet on the cover page iii of the previous month’s issue the magazine itself had referred to ‘Professor H.J.R. Murray’. 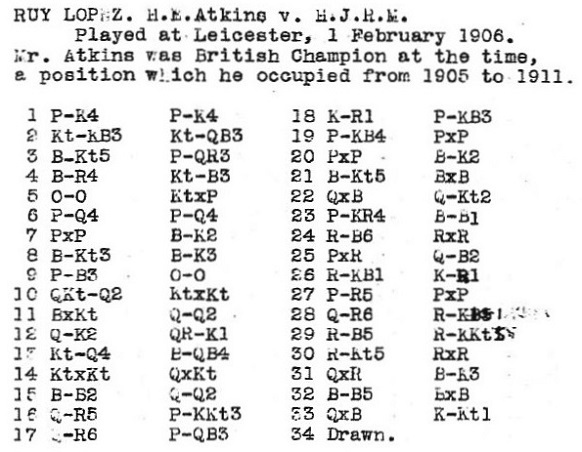 For further instances of that error see The Chess Historian H.J.R. Murray. 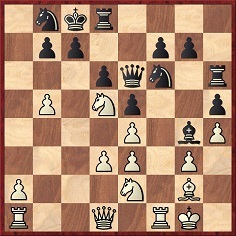 That question, actually put to a candidate for a FIDE post and published in a chess magazine, is an extreme example of a longstanding problem mentioned in Chess Thoughts: In proper journalism, the interviewer probes, politely but searchingly. In chess journalism, vacuous servility is the norm. The word is interview, not intervertisement. As shown in C.N. 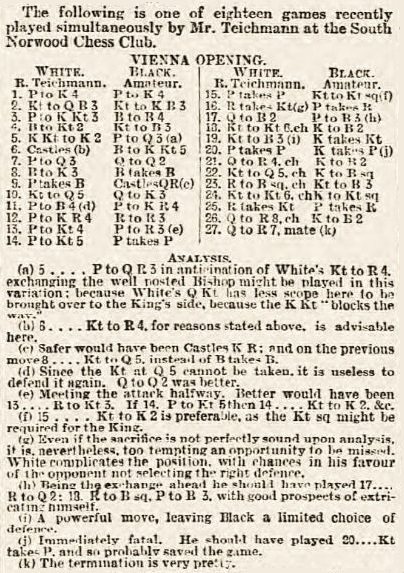 6857, the text was reproduced on page 98 of Lasker’s Chess Magazine, September 1908. Concerning the controversy, see the references in the Factfinder and, particularly, in C.N. 7109. The report, headed ‘Monday’ (i.e. 29 December 1930), states, improbably, that the hotel fire occurred ‘this morning’. On that day, as shown by page 389 of the Skinner/Verhoeven book on Alekhine, the world champion was in Novi Sad, having previously been in Subotica. 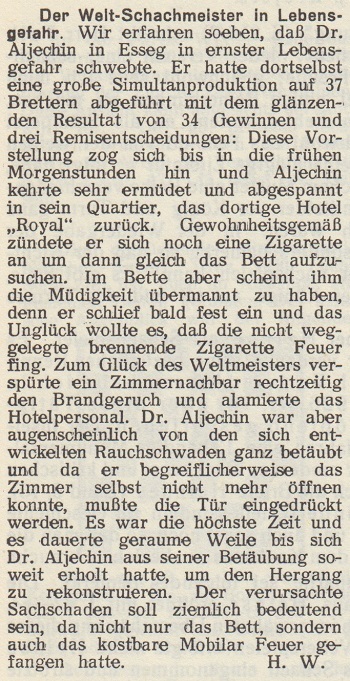 On 23 December 1930 he gave a simultaneous exhibition in Osijek, the city referred to in the Wiener Schachzeitung report (Esseg in German). 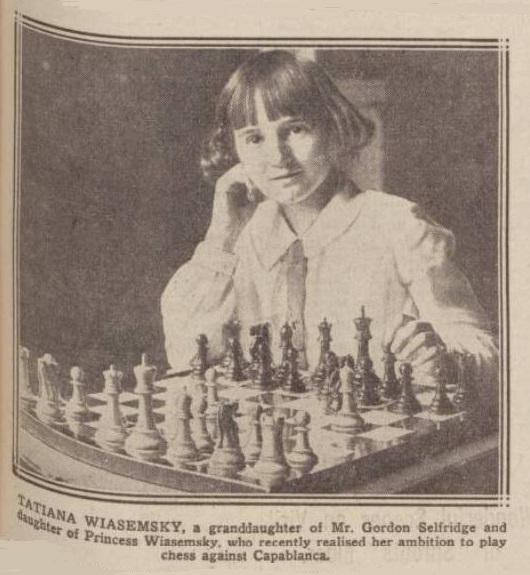 The above, from the 14 May 1929 edition of De Sumatra Post (Medan), is one of a pair of photographs of Princess Tatiana Wiasemsky/Wiazemsky in C.N. 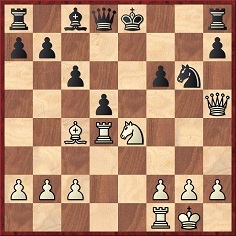 7633. 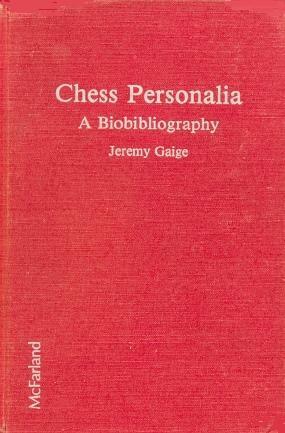 Chess Personalia A Biobibliography by Jeremy Gaige was published by McFarland & Company, Inc. in 1987, and a paperback reprint was issued in 2005. Gaige died in 2011. The paperback edition corrected a large number of typographical errors in the Introduction but had no updating of the biobibliographical entries, even though Gaige had continued to add information to his archives, and notably in an 860-page revised, updated and expanded edition privately circulated in 1994. Any chess writers tempted to boast – in book publicity material or in a Preface, for instance – that they have found corrections to Jeremy Gaige’s Chess Personalia (Jefferson, 1987) naturally need to check that the matters were not rectified by Gaige himself in his unpublished 1994 edition. 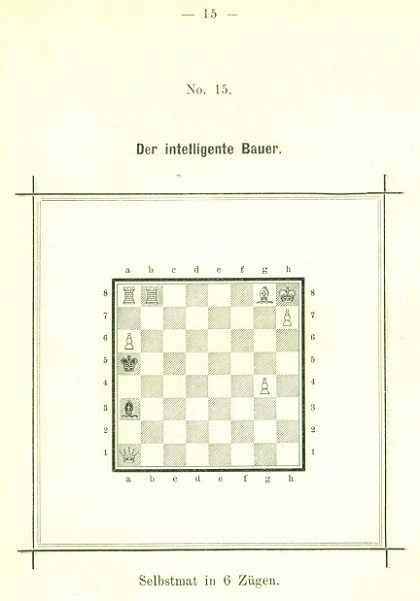 Throughout his life, Gaige circulated private editions of his works to researchers who might be able to assist him, and it is self-evident that he did not cease updating Chess Personalia after the book was published in 1987. That leaves Mr Franklin’s comments about whether Harding should have known about the privately distributed edition. 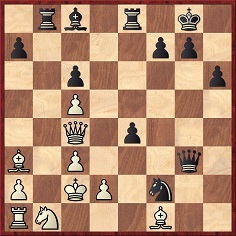 It has been referred to in C.N.s 2799 (posted in 2002 and reproduced on page 153 of our McFarland book Chess Facts and Fables), 3595, 4398, 4579, 4609, 4661 4836, 4982, 5112, 5115, 6975, 7054, 7774, 7854, 8677, 8831, 8945, 9034, 9086, 9135, 9193, 9612, 9668, 9680, 9727, 9773, 9845, 10120, 10156, 10357, 10526, 10680 and 10804. C.N. 8732 (see also The Trompowsky Opening) asked what is known about Bill Ruth’s use or advocacy of 1 d4 Nf6 2 Bg5 in the 1920s. 29 Ra1 Ne6 30 Ng3 f5 31 Ne2 Kg8 32 Nc3 Nd8 33 Rb1 Qc8 34 Qd1 Ra8. Submitted for adjudication. Page 6 of the 14 January 1923 edition reported that J.F. Barry had adjudicated the game as a draw. 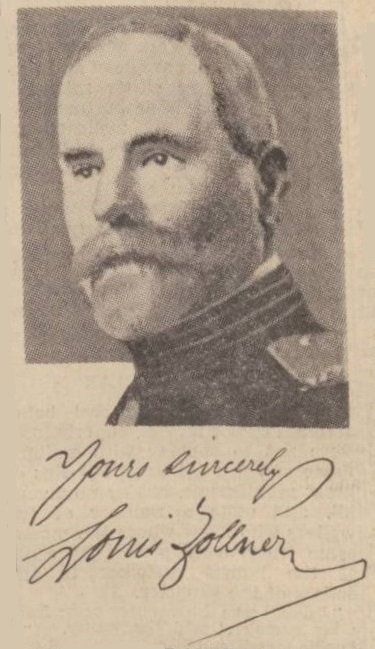 The Russian text was a translation of a 1927 article by Alphonse Goetz; the first sentence in the footnote is a general remark that dates throughout the book, including those taken from Russian sources, are given in the new style. (That does not apply to the date 25 May 1868.) Concerning the Julian and Gregorian calendars, it may be wondered why the difference for that nineteenth-century date is given as 13 days and not 12. 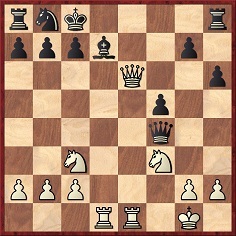 (See When Was Alekhine Born?) One would expect 25 May/6 June 1868. 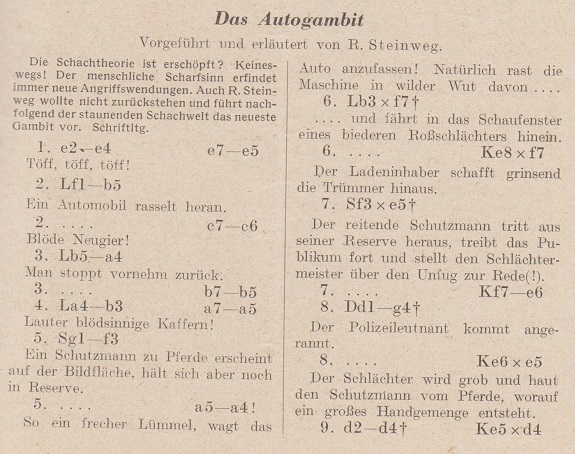 Another question is what relevance the two calendars may or may not have in the context of Janowsky’s place of birth, given in various English-language sources as Volkoysk, Volkovysk, Walkowisk and Wolkowysk (Wołkowysk) and, in German sources, as Walkowijsk, Walkowisk and Waukawysk. 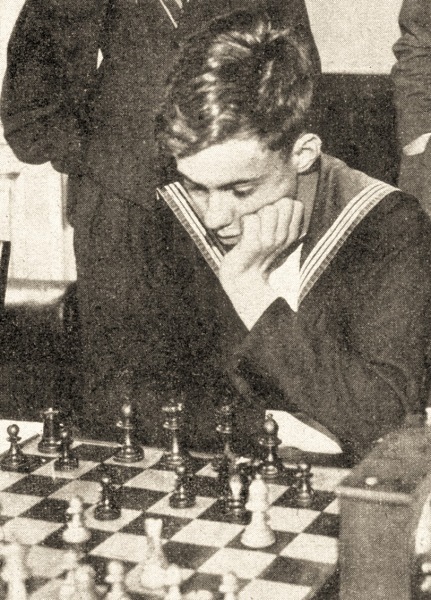 On page 15 of the January 1956 Chess Review, Ossip Bernstein wrote that Janowsky was born ‘in the Polish-Jewish industrial city of Łódź, then still in Imperial Russia’. 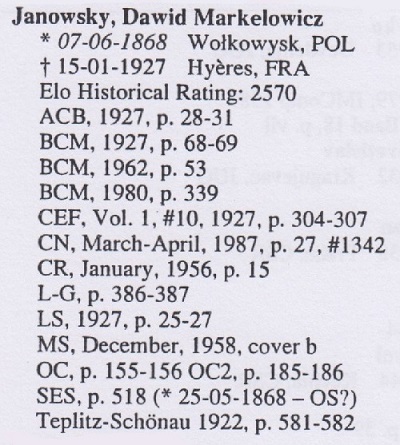 At the very least, we should like to build up a list of publications during Janowsky’s lifetime which specified an exact date and place of birth. 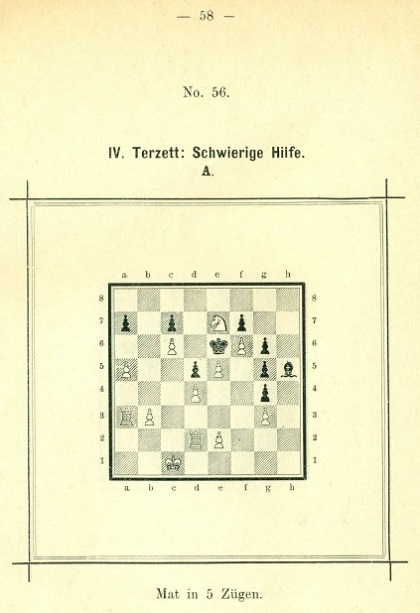 No such information is given in the biographical note on him in the Hastings, 1895 tournament book (pages 355-356); page 581 of the Teplitz-Schönau, 1922 tournament book – another standard source for such information – stated: ‘geb. am 25. Mai 1868 in Walkowisk bei Grodno’. 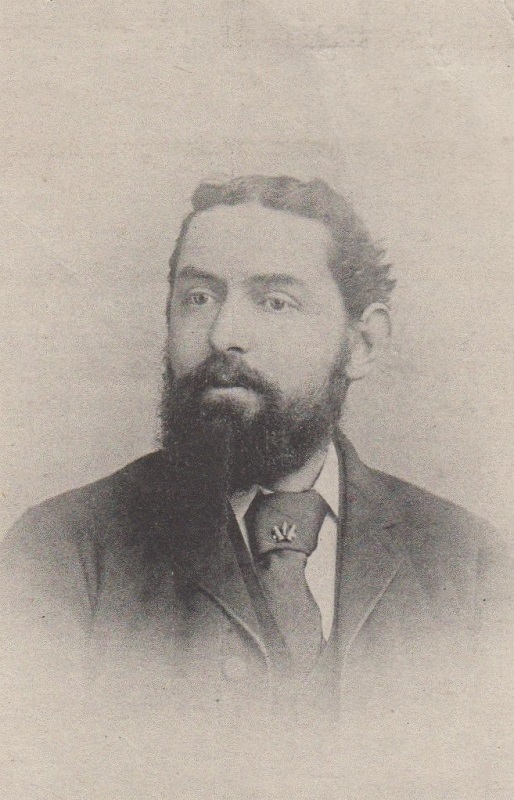 Page 216 of the November 1898 American Chess Magazine reported that ‘he was born in Russian Poland, 25 May 1868’, and the same date was in F.M. 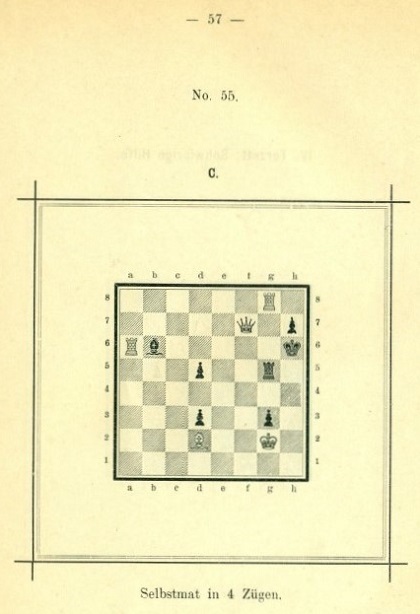 Teed’s ‘Chess Chronology’ on page 169 of the May 1903 issue of Checkmate. 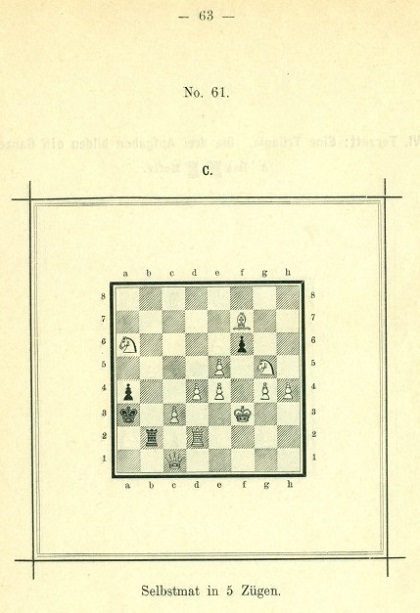 On page 307 of The Year-Book of Chess, 1912 edited by E.A. 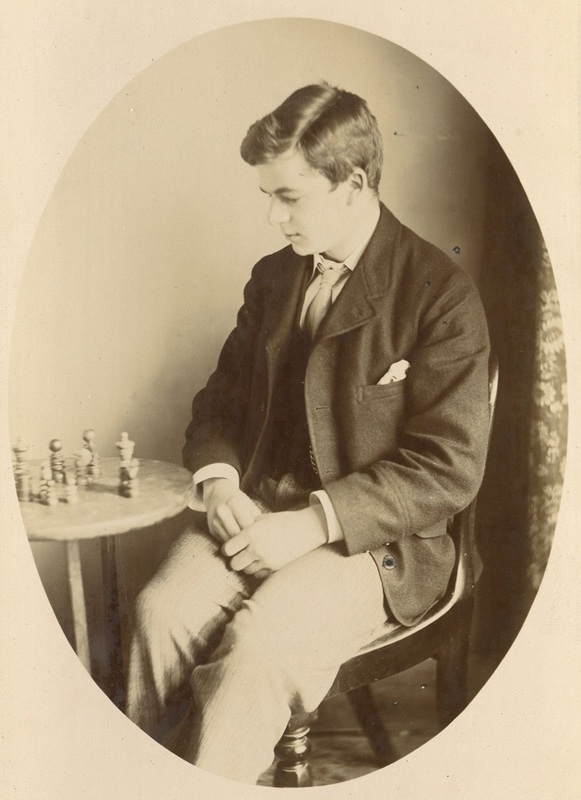 Michell (London, 1912) Janowsky’s entry in the ‘Chess Lovers’ Kalendar compiled by Miss Clara Millar’ had 28 May 1868. In view of the dearth of primary sources, anyone given to Grübelsucht may be tempted to ask provocatively: how can it be stated for certain that even the year 1868 is correct? 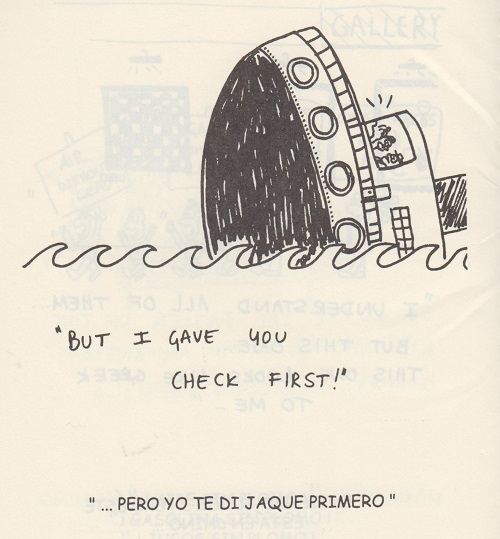 Where is the documentation? Can readers assist us in taking the matter forward? Drawing attention to the Sjakkhistoriskforum, Morten Lilleøren (Oslo) informs us that three years ago a project was started to scan Norwegian chess periodicals and that about 99% of all such publications (approximately 60,000 pages) are now on-line. 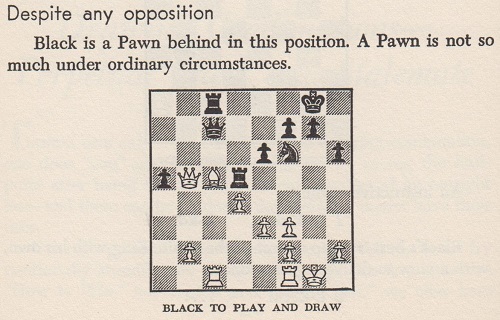 The text had previously appeared in an article by Horowitz on pages 87-89 of Chess Review, March 1954. 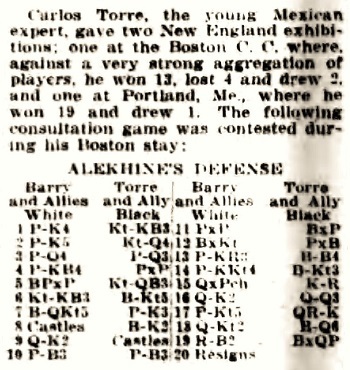 The play by ‘young Alekhine’ occurred when he was 30, against Teichmann at Carlsbad, 1923. 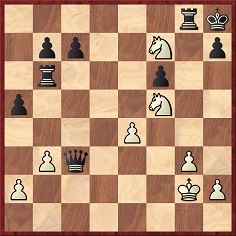 The game was drawn, though later on and not by perpetual check; Teichmann could not sacrifice his queen in the diagrammed position because it was White’s move. 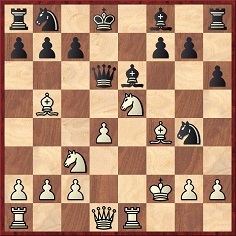 Alekhine played 27 f4. 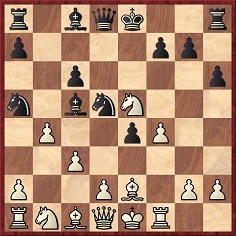 The complete game: 1 d4 d5 2 c4 e6 3 Nf3 Nf6 4 Nc3 Be7 5 Bg5 Nbd7 6 e3 O-O 7 Rc1 c6 8 Qc2 Re8 9 Bd3 h6 10 Bf4 dxc4 11 Bxc4 b5 12 Bd3 a6 13 a4 Bb7 14 O-O Rc8 15 Qb3 Qb6 16 Ne5 Red8 17 Ng6 Bf8 18 Nxf8 Nxf8 19 Ne4 Nxe4 20 Bxe4 Nd7 21 Bd6 Nf6 22 Bc5 Qc7 23 Bf3 a5 24 axb5 cxb5 25 Qxb5 Bxf3 26 gxf3 Rd5 27 f4 Ne4 28 Rc2 g5 29 f3 Nxc5 30 Rfc1 Rb8 31 Qe2 gxf4 32 dxc5 fxe3 33 Qxe3 Rg5+ 34 Kh1 Qc6 35 Rg1 Rxg1+ 36 Kxg1 Qd5 37 Rd2 Qf5 38 Rg2+ Kh7 39 Qe4 Qxe4 40 fxe4 Rc8 41 Rc2 Kg6 42 Kf2 Kf6 43 Ke3 Ke5 44 Kd3 f6 45 Rc4 f5 Drawn. 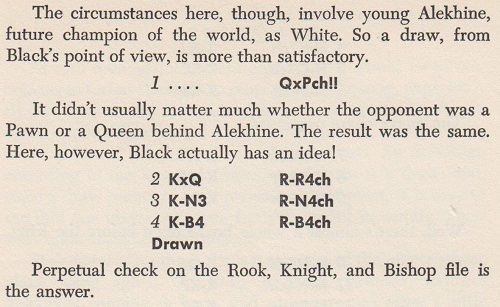 The opening was examined by Alekhine in his first Best Games book, in the annotations to his brilliancy-prize victory over Rubinstein in the first round of the same tournament. 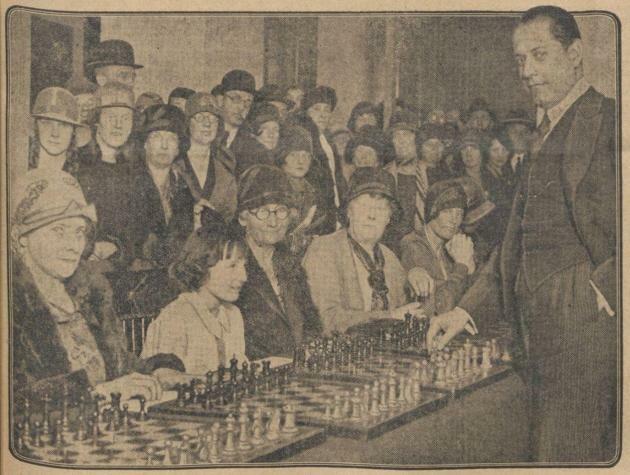 Gerard Killoran (Ilkley, England) notes that a register of chess visitors to the Mechanics’ Institute in San Francisco is available on-line. C.N. 10776 referred to the financial support given to Dawid Janowsky, shortly before his death in Hyères, by A.J. Maas. 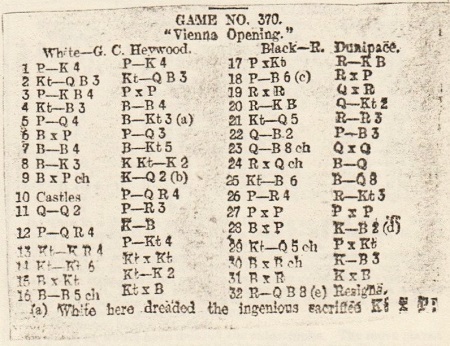 As mentioned above, the Womanhood column dated the game 1892. 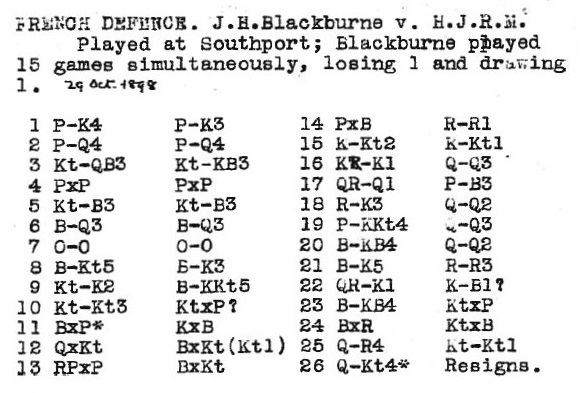 Page 218 of Harry Nelson Pillsbury American Chess Champion by Jacques N. Pope (Ann Arbor, 1996) gave it as the only known score from a five-game rook-odds match won by Pillsbury against W. Southwick in Brooklyn, 1894. 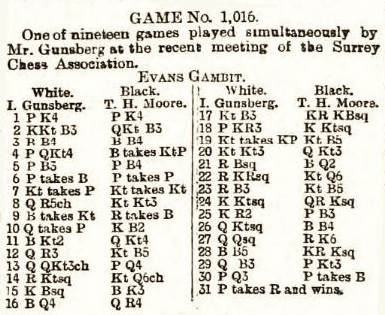 Pages 220-222 published seven of the ten games played in a second match (Brooklyn, 1894-95) between Pillsbury and Southwick at the same odds. 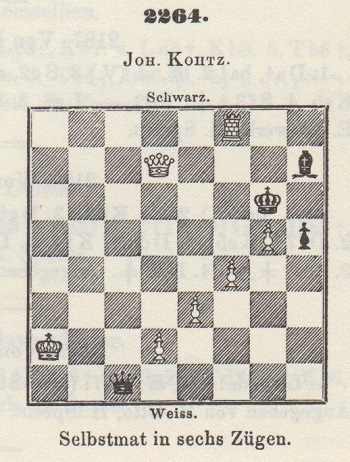 The two matches were discussed on pages 7-9 of Pope’s fine book. Pachman’s book gave no additional information about the occasion. 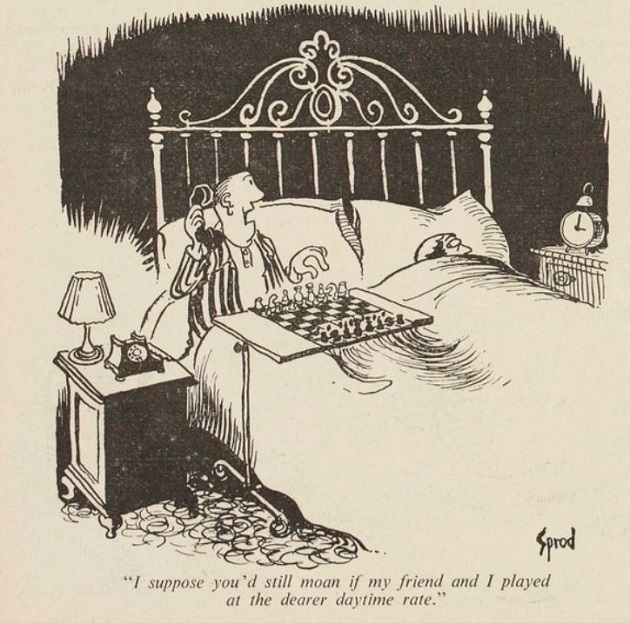 Nor did page 100 of CHESS, 14 November 1938, where the full score was included in the seven-page feature on Louis Zollner referred to in C.N. 6607. 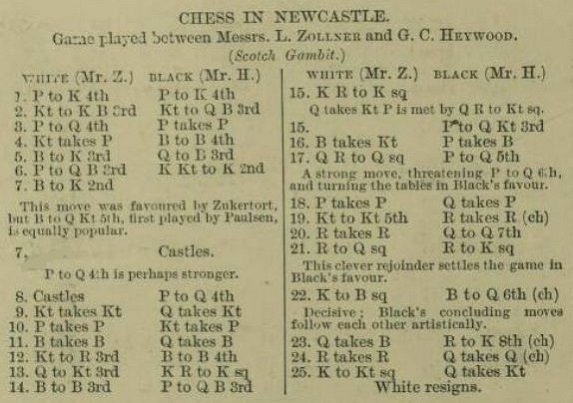 The game had been published on page 574 of the 3 November 1894 issue of the Illustrated London News, again with no date. 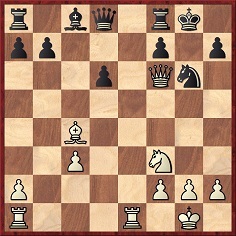 28 Qxf7 Nxf7 29 Rg8+ Rxg8 30 Nxf7 mate. 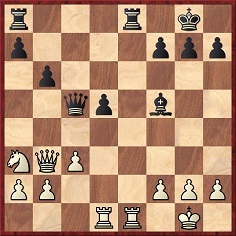 A computer-check indicates that a number of inferior moves were played on both sides. 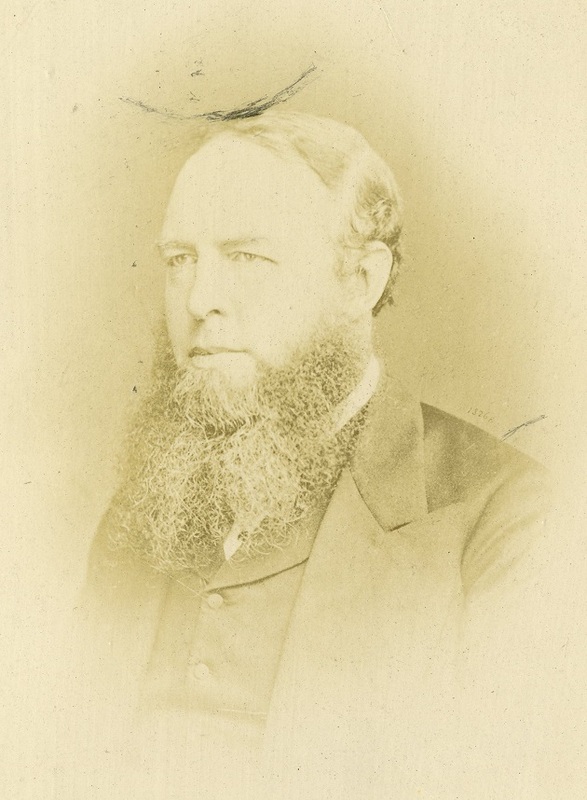 George Cann Heywood died on 8 March 1895, aged 41. 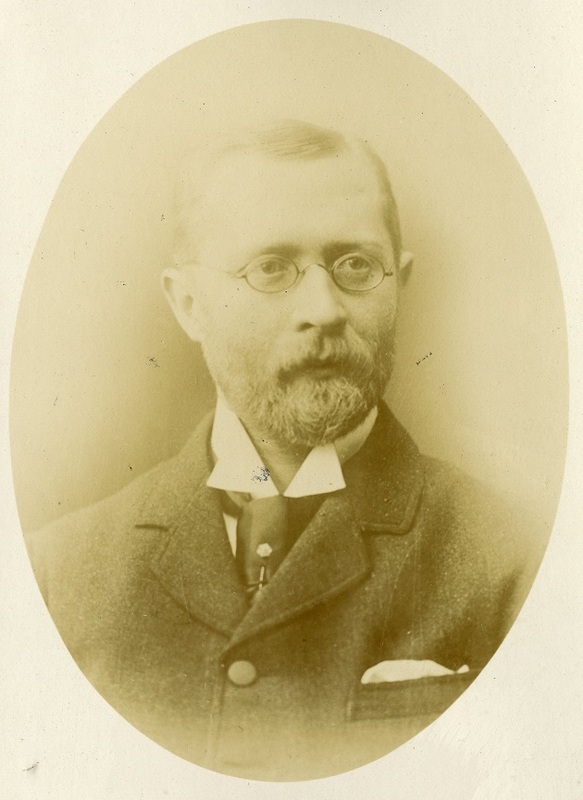 The photograph below is the frontispiece to the December 1893 BCM, accompanying the feature on him published on pages 507-512. 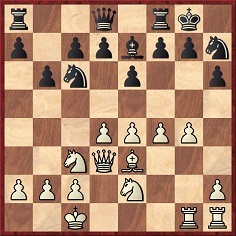 On pages 23-24 of the autumn 1996 Kingpin (see too pages 34-35 of Kings, Commoners and Knaves) we wrote about a composition of Heywood’s which is relevant to the famous Saavedra study. 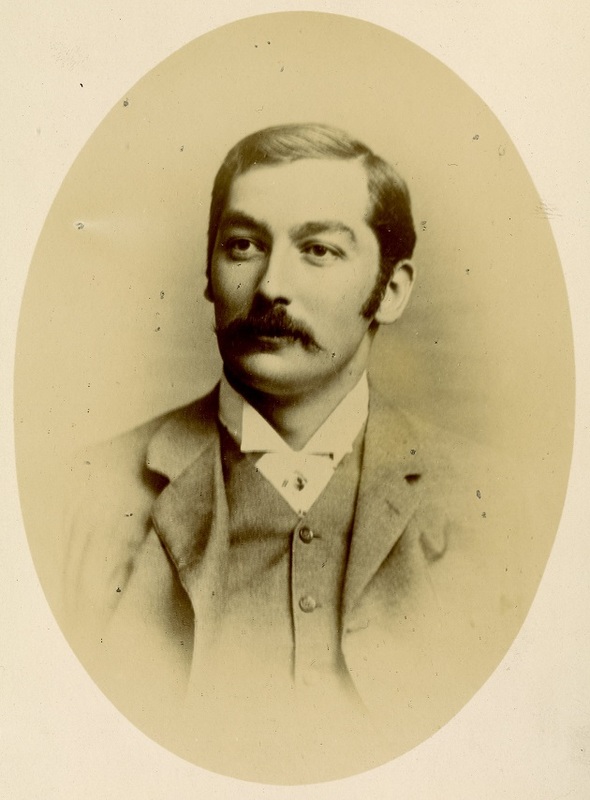 Seven games won by G.C. 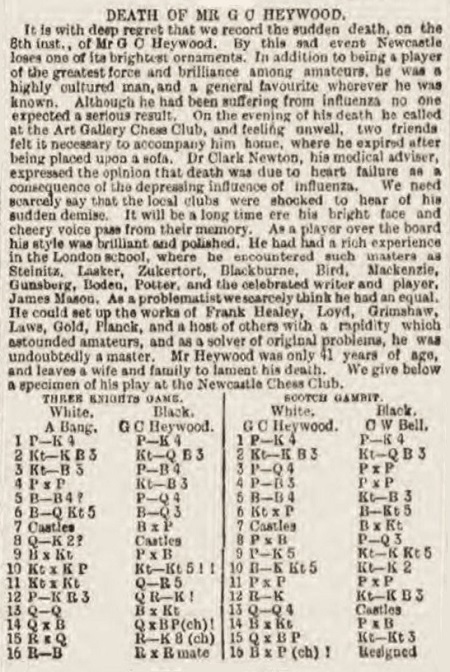 Heywood are taken from late-nineteenth-century chess columns with, unfortunately, scant details as to when and where most of them were played. 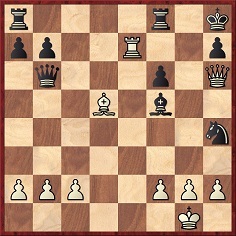 21 Ne4 fxe3 22 Rxg5 Nxd4 23 Rxg7+ Kxg7 24 Rh7+ Kg8 25 Qf7 mate. 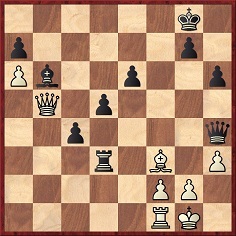 20 Rxd7 b6 21 Rxc7+ Kxc7 22 Nd5+ Resigns. 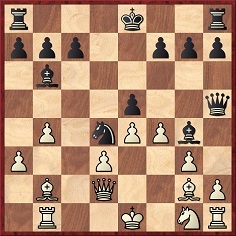 29 Nd5+ cxd5 30 Bxd8+ Kc6 31 Bxb6 Kxb6 32 Rc8 Resigns. 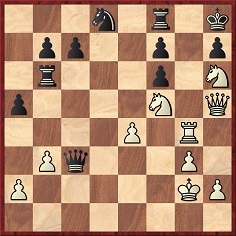 21...Re8 22 Kf1 Bd3+ 23 Qxd3 Re1+ 24 Rxe1 Qxd3+ 25 Kg1 Qxb5 26 White resigns. 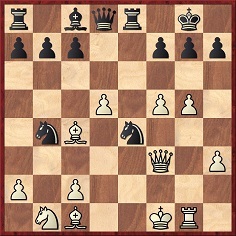 14...Qxf2+ 15 Rxf2 Re1+ 16 Rf1 ‘RxR mate’. 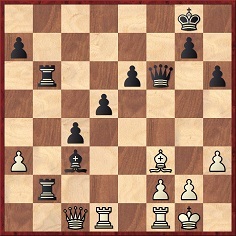 24...Qd3+ 25 Bxd3 exd3+ 26 Qxd3 Nxd3 27 Kxd3 Bf5+ 28 Kc4 Rxb1 29 White resigns. The spelling ‘Cann’ is confirmed by the Family Search website. 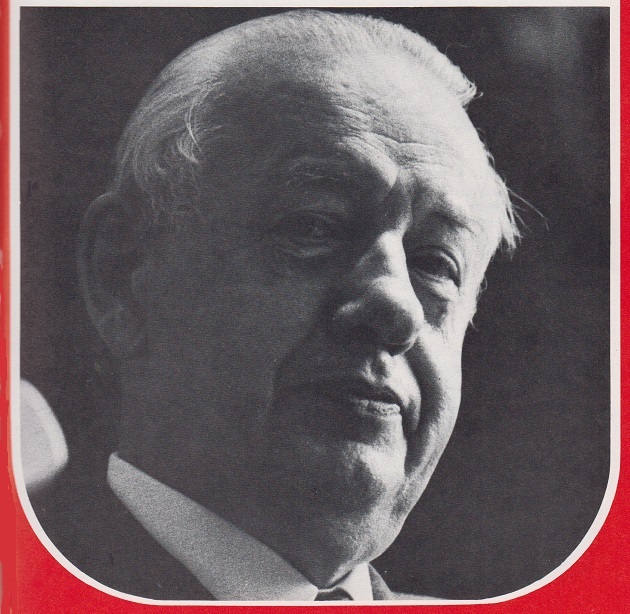 The 1987 edition of Chess Personalia had only ‘George C. Heywood’, and that was amended by Tim Harding on page 351 of British Chess Literature to 1914 (see C.N. 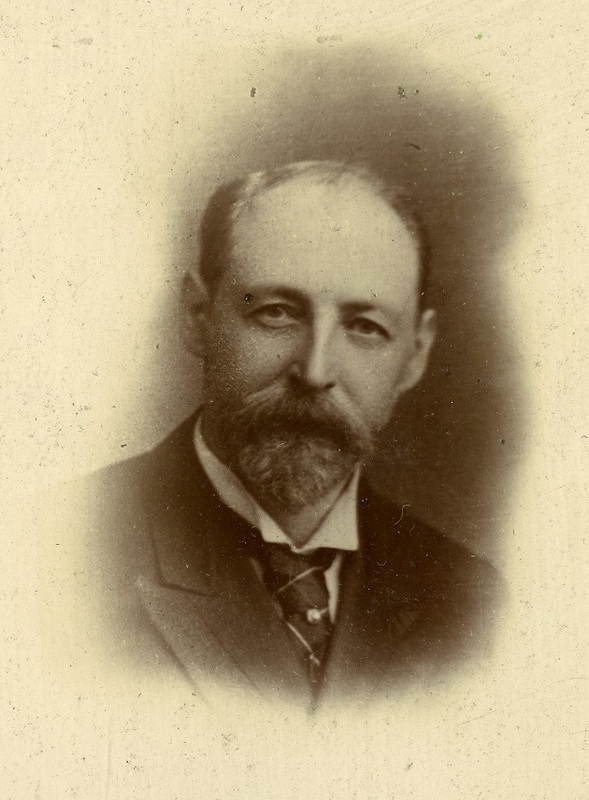 10831) to ‘George Carm Heywood’. 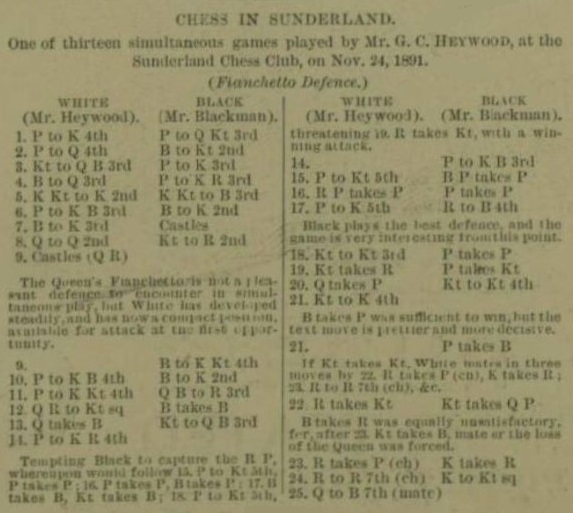 ‘Carm’ was also the spelling used by Harding elsewhere in that book, and in his volumes on Victorian chessplayers and on Blackburne, but it is unclear why. 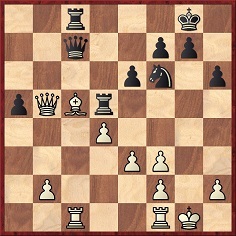 10...Nxd4 11 Bxh7+ Kxh7 12 Qxd4 Bxg3 13 hxg3 Bxf3 14 gxf3 Rh8 15 Kg2 Kg8 16 Rfe1 Qd6 17 Rad1 c6 18 Re3 Qd7 19 g4 Qd6 20 Bf4 Qd7 21 Be5 Rh6 22 Rde1 Kf8 23 Bf4 Nxg4 24 Bxh6 Nxh6 25 Qh4 Ng8 26 Qb4+ Resigns. 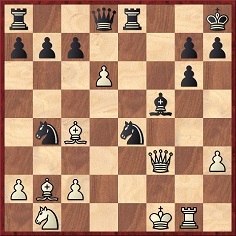 19 f4 fxe5 20 fxe5 Be7 21 Bg5 Bxg5 22 Qxg5 Qg7 23 h4 Bc8 24 Rf6 Rxf6 25 exf6 Qf7 26 Rf1 Kh8 27 h5 gxh5 28 Qh6 Rg8 29 Rf5 Rg4 30 Rg5 Rxg5 31 Qxg5 Be6 32 Bf5 Bxf5 33 Qxf5 Kg8 Drawn. 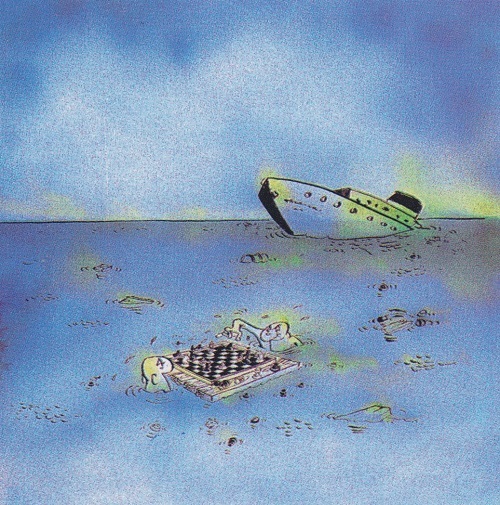 See too page 56 of Short v Kasparov The Hi-jacking of The World Chess Championship by William Hartston (London, 1993), page 43 of Square Minded by Saskia de Winter and Willy de Winter (Condesa, 2001) and page 17 of Chess for Laughs by Joel Rothman (London, 2007). 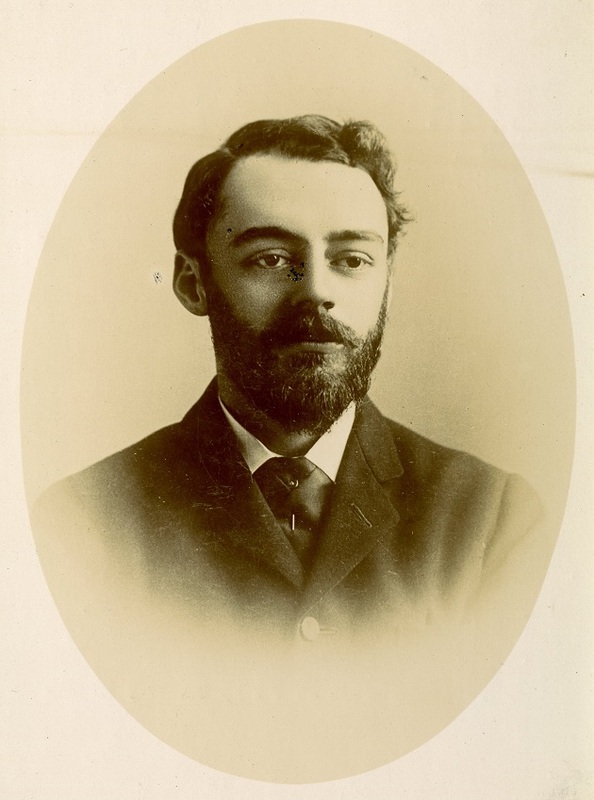 Bob Meadley (Narromine, NSW, Australia) has sent us two large files of information on François André Danican Philidor: part one; part two. 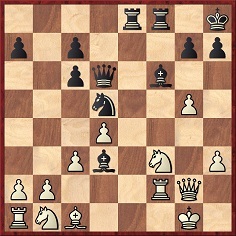 21...Rg8 22 Be6 Rxg2+ 23 Kh1 Rxh2+ 24 Kxh2 Qxf2+ 25 Kh1 Qg2 mate. 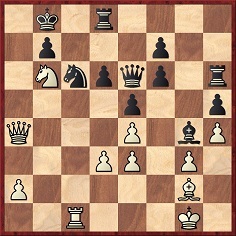 36...Rxf3 37 Qxb6 axb6 38 gxf3 Qd8 39 White resigns. Newcastle Evening Chronicle, 17 April 1939, page 10. 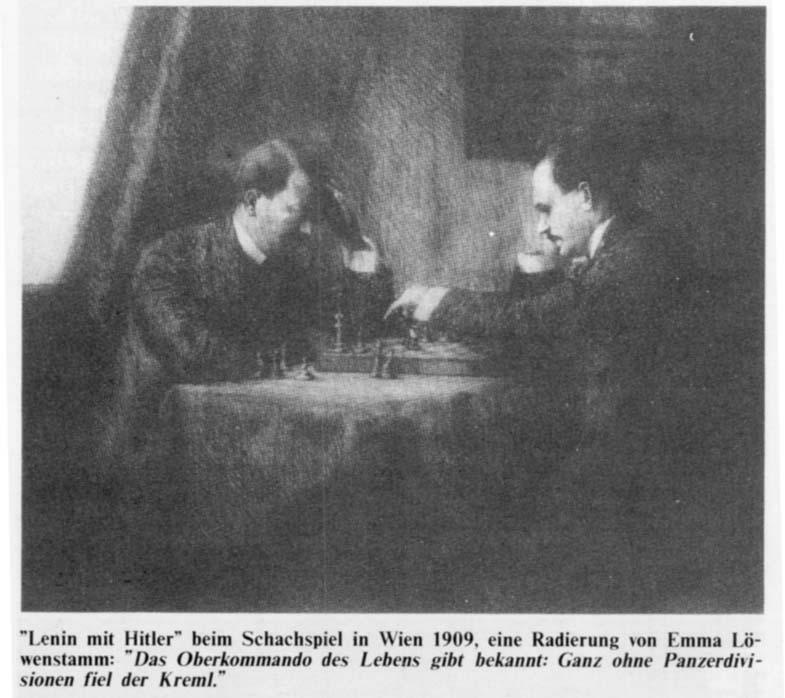 Yury Ryabokon (Moscow), who is a producer with the Russian broadcasting company NTV, asks whether more information is available about this purported picture of Hitler and Lenin (published in the magazine Europa Vorn, spezial Nr. 1/4. Quartal 1991), which a correspondent sent us in 2005. At that time, the picture became widely known and gave rise to a barrage of speculation, though no facts. Is it possible to do better today? 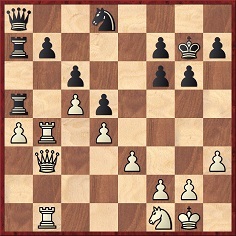 1 e4 e5 2 Bb5 c6 3 Ba4 Nf6 4 d3 Bc5 5 f4 Bxg1 6 Rxg1 d5 7 Nc3 exf4 8 exd5 Nxd5 9 Qe2+ Be6 10 Nxd5 Qxd5 11 Bb3 Qd6 12 Rf1 g5 13 Bd2 Kd7 14 O-O-O Bxb3 15 axb3 Qg6 16 Rde1 Rd8 17 g3 fxg3 18 Qe7+ Kc8 19 Rxf7 Nd7 20 Bxg5 Kc7 21 Re6 g2 22 Bf4+ Kc8 23 Rxg6 hxg6 24 Be3 Resigns. 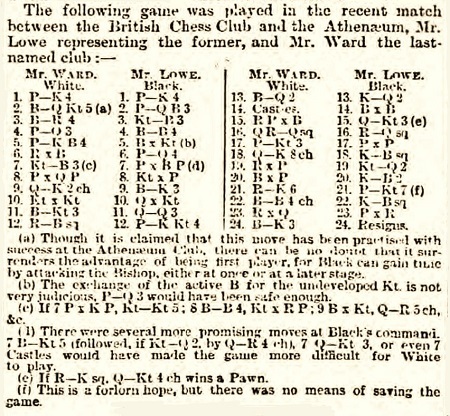 This game, between W. Ward and H.F. Lowe, was played at the British Chess Club in London on 19 January 1894 (BCM, February 1894, page 57). Can a reader send us what appeared in the magazine in question? 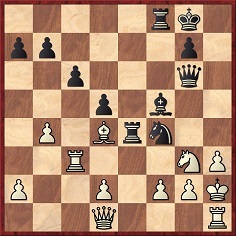 1 e4 e5 2 Bb5 c6 3 Ba4 b5 4 Bb3 a5 5 Nf3 a4 6 Bxf7+ Kxf7 7 Nxe5+ Ke6 8 Qg4+ Kxe5 9 d4+ Kxd4 10 e5+ Kxe5 11 Bf4+. Can the source be traced? 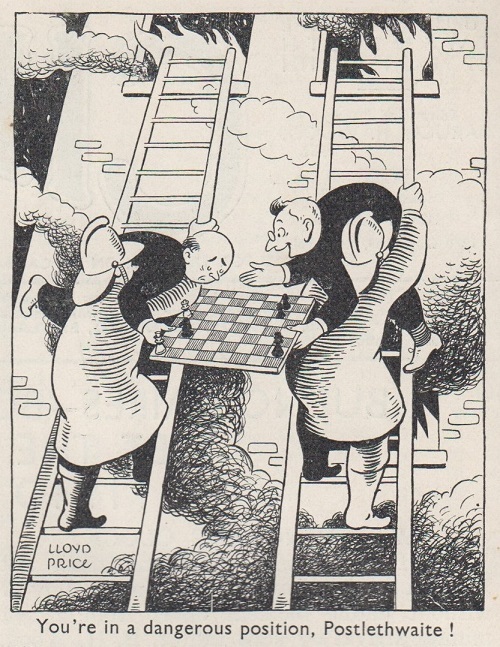 As mentioned in Chess and Bridge, Alan Truscott (1925-2005) wrote the Foreword to Brains in Bridge by Gerald Abrahams (London, 1962 and New York, 1964). 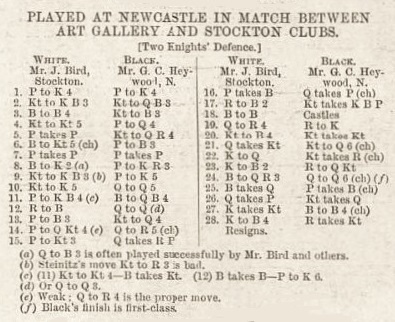 Three chess games won by Truscott were given in C.N. 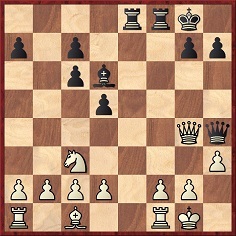 3280 (see pages 131-132 of Chess Facts and Fables). 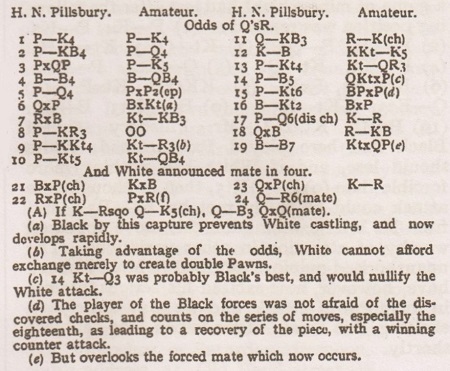 The feature article mentioned in the previous item also noted Abrahams’ reference on page xi of Brains in Bridge to another expert on both games, Victor Lionel Wahltuch. We have not yet found information about the Newcastle v Manchester match. 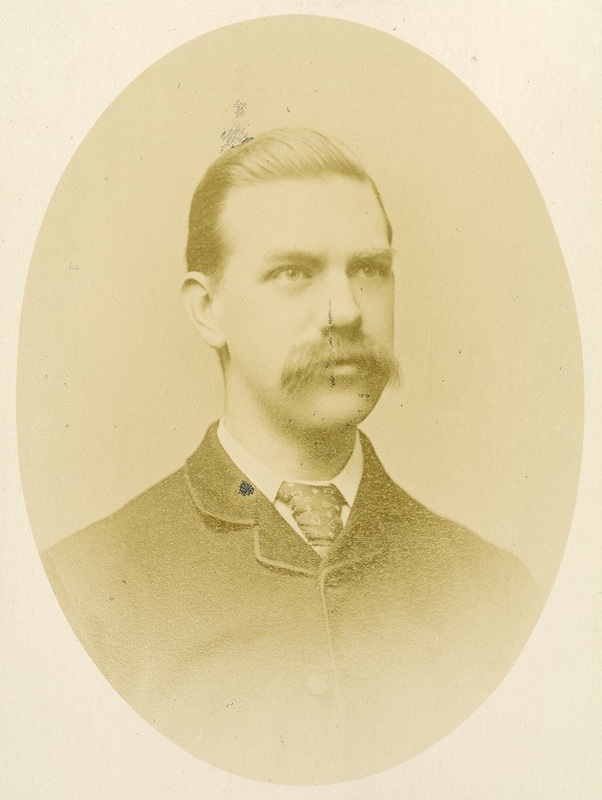 From the source mentioned in the previous item (The Chess Album, August 1894), below, again courtesy of the Cleveland Public Library, is a photograph of Philip H. Williams. 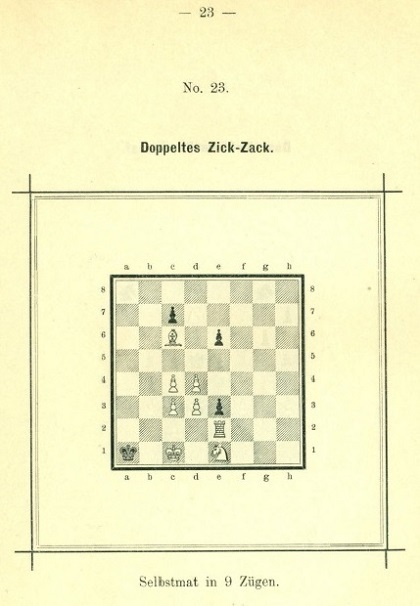 Further to the reference by Chris Ravilious to Sneek v Leeuwarden (two cities in the Dutch province of Friesland), the difficulty of establishing a first-hand nineteenth-century source for that game is noted by Frits Fritschy (Marval, France). 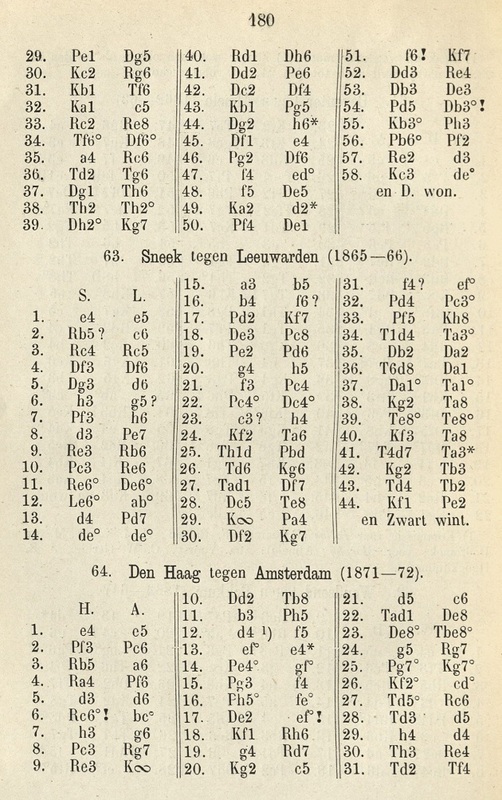 In two books focussing on correspondence contests between clubs/cities, Carlo Alberto Pagni gave only a 1991 work as his source for the pair of games (beginning 1 e4 e5 2 Bb5 and 1 e4 e5 2 Bc4) between Sneek and Leeuwarden, which he dated 1865-66: Tweehonderdvijftig jaar correspondentieschaak in Nederland by L.C.M. Diepstraten (Venlo, 1991). 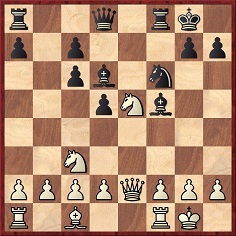 Regarding Pagni’s volumes, the references are page 40 of volume two of Correspondence Chess Matches Between Clubs 1823-1899 (Turin, 1996) and page 122 of Scacchi senza quartiere (Cesena, 2004). We plan to revert to this topic shortly. 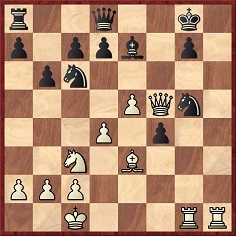 16...exf4 17 Bxd4 Bxd4 18 Qxf4 O-O 19 h3 Be6 20 Nf3 Bc3+ 21 Ke2 Qb5 22 Rbc1 Bb2 23 Rc5 Qa4 24 Qd2 Bxa3 25 Rb1 b6 26 Rxc7 Rac8 27 Rxc8 Rxc8 28 Nd4 a5 29 Kf3 Bxb4 30 Qf4 Qd7 31 Qe3 Bc5 32 White resigns. 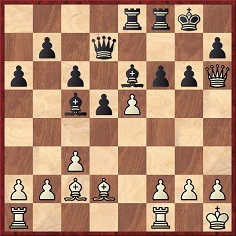 25 Rxc6 bxc6 26 Qa8+ Kc7 27 Qa7 mate. 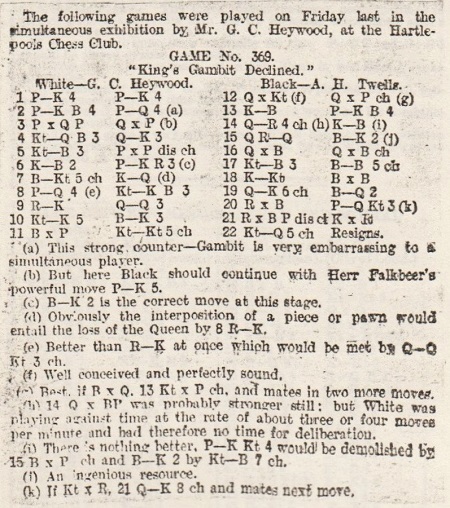 Page 21 of the January 1894 BCM reported that Teichmann’s display (+15 –1 =2) at the South Norwood Chess Club was on 15 December 1893. 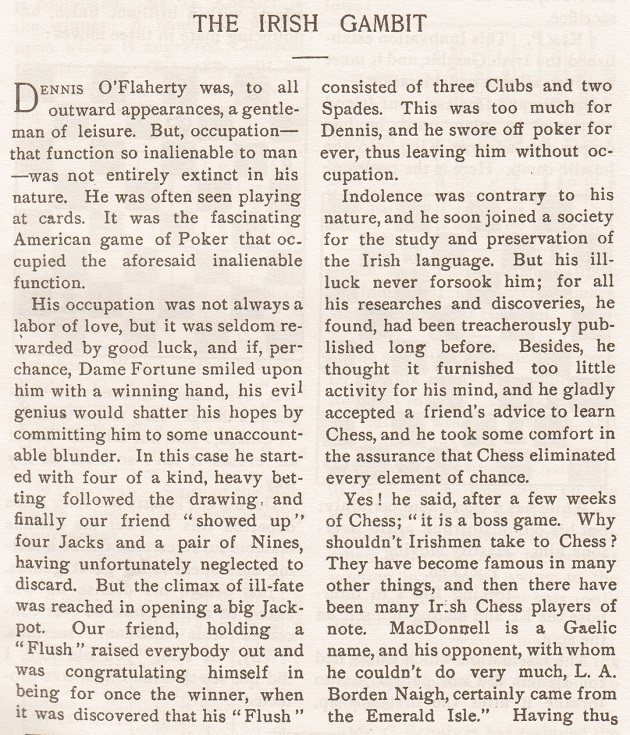 See too page 345 of the American Chess Magazine, February 1899, which was our source in C.N. 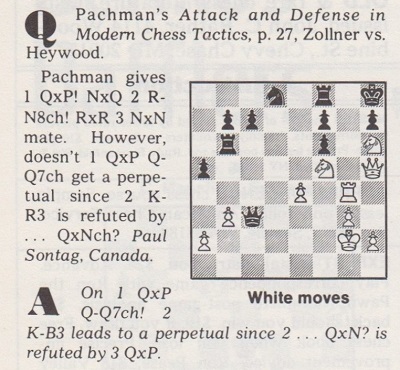 1985 (page 69 of Kings, Commoners and Knaves). 1930s shots of Joseph Schildkraut. 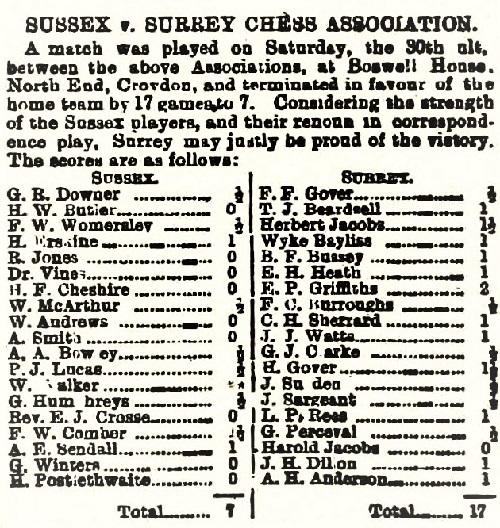 For general guidance, our correspondent has added a list of the top members of the Sussex chess team that year, from page 5 of the Sheffield and Rotherham Independent, 13 March 1886. A composition of his was shown in C.N. 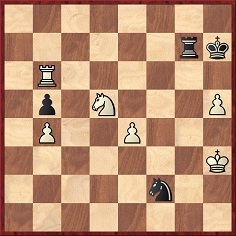 10693, from page 42 of Terms and Themes of Chess Problems by S.S. Blackburne (London, 1907). 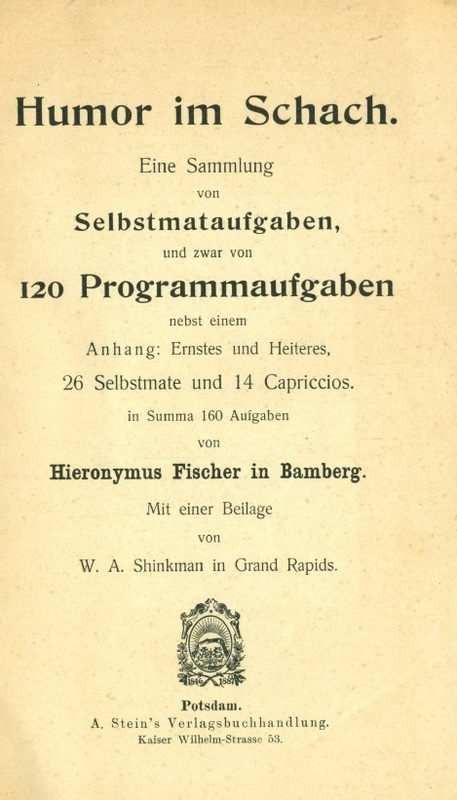 Another was on page 141, but in neither case was Fischer named. 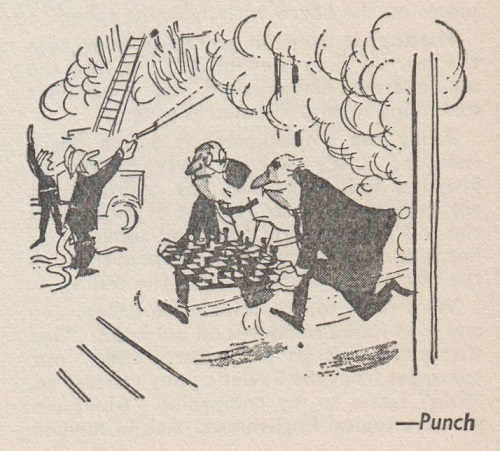 Only the title of his book was given – misspelt as ‘Humor in Schach’ and ‘Humour in Schach’. 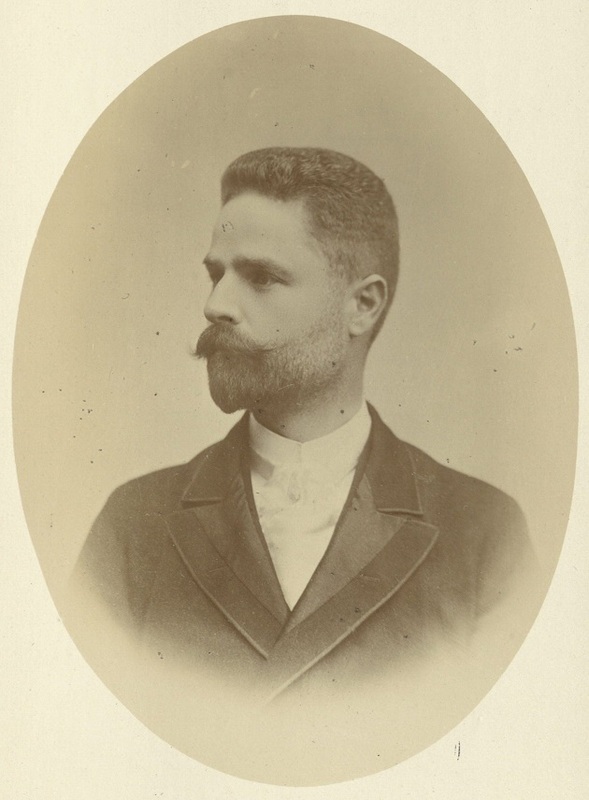 Mr McDowell adds that the last two compositions above were among five by Fischer in Friedrich Chlubna’s 1998 book Versunkene Schätze, a collection of problems from the period 1891-1913 which were considered to be of high quality but little known.